I was creating a new virtual machine to install the latest Oracle SOA Suite (11.1.1.4) and, during my biased next/next/finish routine, forgot to configure the hard disk size. After installing almost everything, I realised that the VM was running out of space. Instead of installing everything again, I’ve asked my friend Google to help me. Among a diversity of creative, complex, weird and dodgy ideas I could compile the solution described below (which can also be creative, complex, weird or/and dodgy for you!). The procedure described below was tested with Oracle VirtualBox 4.0.2 and Ubuntu 10.04, so I’m not sure if it will work with older versions. 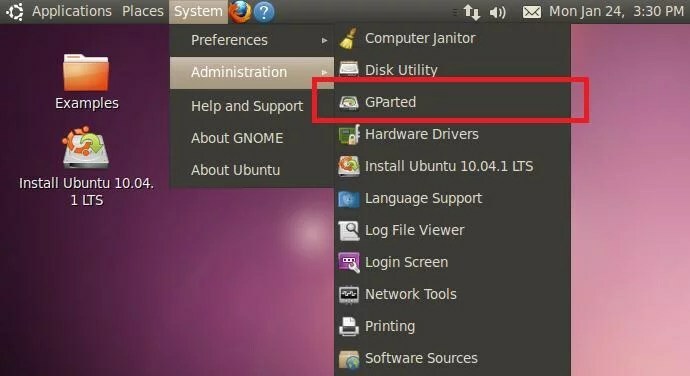 Because Ubuntu default installation uses a single partition layout (so you cannot “unmount” the partition to be extended), you will need the Ubuntu Live CD (installation media or image) to do the trick. 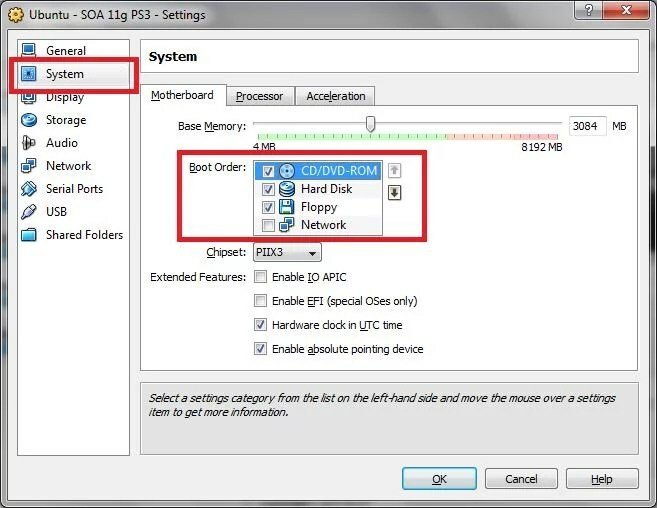 Go to the VM settings and set CD/DVD drive as the first device (make sure the CD/DVD drive for this VM is pointing to Ubuntu Live CD). The Ubuntu install wizard usually creates a swap partition and I couldn’t resize the main partition because the swap partition was in the middle (I am open for suggestions here!). Right click on the partition that you want to extend and choose ‘Resize/Remove’ . 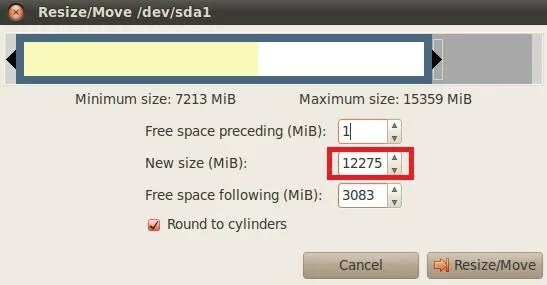 Choose the new size for your hard disk. 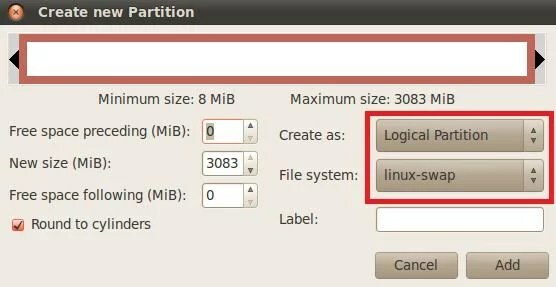 Now create a logical partition and set ‘linux-swap’ as the file system. I had this exact problem as I ran outta disk space in my Ubuntu Virtualbox. Unfortunately, the swap partition was mounted even when booting from the “Live CD”. So, I downloaded the GParted iso image from http://sourceforge.net/projects/gparted/files/ and booted from that instead. Worked beatifully. I just selected swapoff so I could resize the swap with the new unallocated space, then moved that space to the extended partition container and finally to the boot partition. No need to delete and recreate the swap, but same difference. Thanks for the tutorial. Worked like a charm. Wow. Thank you soooo much. This is exactly what I needed and it worked perfectly (resizing an Ubuntu 11.04 guest in a Windows Vista host). thanks a lot! That’s exactly what I needed! Excellent tutorial. Thank you very much. Just one thing I wanted to add. I was using my Ubuntu 12.04 live CD and getting a critical error from VirtualBox when resizing (a 40G partition). Instead I used the gparted live cd and everything else was fine. Not sure if it was just this tool, but the swap was at the end for me. So I didn’t have to rebuild the swap, could just extend the partition. VBoxManage.exe: error: Resize hard disk operation for this format is not implemented yet! I added an extra zero (204800) and it worked. Thanks for this. Just curious about how big you made your new swap space. I see a lot of controversy over this.